Firstly - does everyone know the new Mystery Stole 3 is about to begin??? First clue is posting tomorrow and we are all excited about it! Kelly, a wonderful customer of ours who is an avid sock knitting machine cranker, came in looking for a 13/14 crochet hook on for adding the beads to the shawl. I immediately was interested in this technique as I have been prestringing the beads on my yarn for the beaded scarf from Janet's wonderful class a few weeks ago. The beads on the yarns make such a gorgeous fabric! Kelly mentioned that the Mystery Stole 3 from the Pinklemontwist.blogspot.com was about to begin. Cool I think! I will have to look into it! Then Carol, our weaving teacher, comes in that evening looking at the Lornas Laces Helens Lace to use for the Mystery Stole 3 - I am thinking okay that is two in one day - I am in! So Carol and I start to pick out our yarn and I sign up to the membership for the stole and find that 3300 other knitters have also signed up.... holy lacework batman! So if you are working on the Mystery Stole 3 we want to share and help in the experience - so if you are looking to compare, seek hands on assistance, or simply want to work on your stole in a very fun atmosphere with fellow stolers (with air conditioning), come by! We are very excited and working on our swatches. The first clue is being published tomorrow, Friday, June 29th, cast on day should be a blast! We are here 10 - 5 on Friday and 9-5 on Saturday and want to talk lace with you! Other amazing things - Nancy finished her Goby sweater and although she felt it took her a long time, total time spent (including a few ripouts here and there) was just under 6 weeks. She looks beautiful in her yellow sweater! Tonia Barry taught a finishing class which Nancy used the techniques for assembling her pieces and Pat, another of our wonderful customers, sewed her zipper in and voila! Another wonderfully assemble garment! Nancy wore the sweater for the rest of the day and was thrilled - good thing for air conditioning! And the last of my most exciting news is I met with Elaine Brody who is the rep for some very interesting yarn companies. 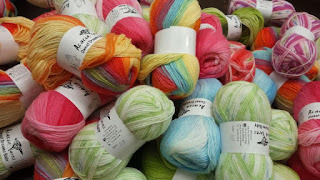 We have the most gorgeous yarn sprinkling in over the next few months! For example, we will be showered with Dream in Color Yarns, Madeline Tosh, Jade Sapphire, Schaefer Yarns, Artyarns, and we are bringing in the Filature Di Crosa Superior yarn line! Woo hoo! We have also adding Posh Yarn as well as Grafton Fiber to our line up for Fall. Hope to see you soon and we hope you are having a great summer!